This is the one movie I've never been able to find, and I don't remember anything about it except one scene: A man is eating in a restaurant, and there's a pool on the roof, which sinks down into the middle of the restaurant and has glass on all sides so patrons can see into it like an aquarium. A woman up top strips naked and goes swimming in the pool, oblivious (?) that the guests eating dinner downstairs can see her. I think that's what happened. Saw this probably twenty years ago. Any ideas? I'm convinced I've seen a scene like that from a more recent film. I even remember the tables at the restaurant. 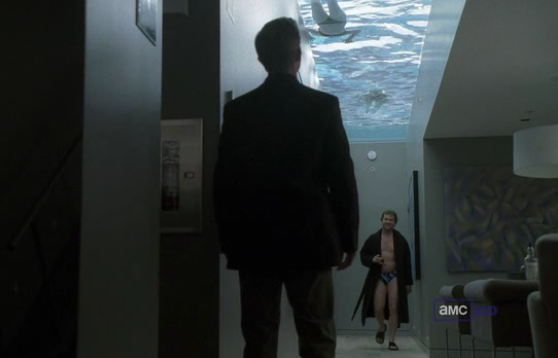 But maybe it was an aquarium, and there was a person swimming in there incidentally. It was either from a gangster or spy movie, or a comedy. But the aquarium/pool didn't "sink down" into the restaurant; it went all the way to the floor. That sounds right -- how recent are you thinking? I have no idea. I remember it being perhaps part of a chase sequence, but that could be wrong. Edgy TV show-watching Russian bodybuilder cartoon. I seem to be picturing a movie where someone goes in a house, maybe to a party, and you can see someone swimming overhead in water. You only see a hallway width of a pool above with a clear bottom that people below can see through. I think that's a scene from The Killing (Season 1 or 2), at the rich libertarian guy's house. Seriously, it looks like the same house, but it's probably not, because pool ceilings (and apparently pool ceiling hallways?) are a thing. That's the one I was talking about. I haven't seen the entire movie, but it was making rounds on the movie channels and I probably saw this scene. 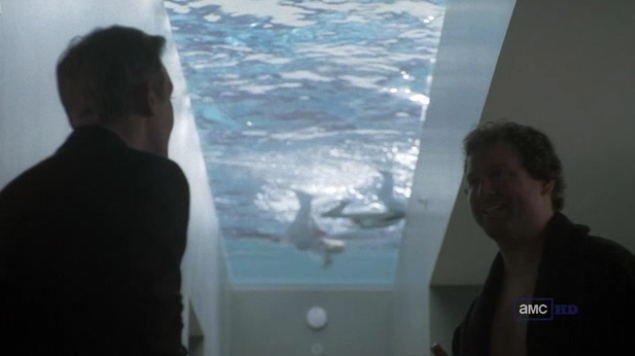 This is reminding me of another unique pool in another movie - it starts off inside, a woman is in her swimsuit, part of the pool comes into the room, there is a glass wall to the outside and you have to duck/swim under and it opens into an outside pool. There's a good chance it was some TCM Underground movie, but I DVR a lot, no telling. Trying to remember a movie with a specific scene where a dude gets fired for looking up a female coworker's address and sending her flowers on her birthday? Seems like a Solondzian touch, but I think I'm wrong. Office Space? Well, at any rate, there's an office involved. You should know this. Hint:the guy who made it is from your town. This guy axo is good. i need yalls help with this. i've been trying to remember this movie for a ridiculously long time, like more than ten years. tonight i heard one of the songs from it, in something else. i distinctly remember the way the scene looked and felt now, with the music, but nothing else to go on. i need yall to list any movie you know that contains this song, i've looked up on different sites and none of them are it, and the lists are incomplete as well. any help will be appreciated. All I can find is The Aviator, a season one episode of American Horror Story, and this movie I've never heard of. i heard it in the ahs episode last night. i've actually seen treasure island. it's a really strange black and white noir set in ww2 about the secret sexual lives of some code deciphering specialists. also nick offermans first actual film role. yeah. i'm thinking at this point that i've crossed over memories of that song and it triggered the wrong thing, because i'm ALMOST positive it's not treasure island. it's fairly difficult to get ahold of, but i'm going to try to rewatch it to make sure. it's definitely not the aviator. ps: its a great song, so continue to list movies which have used it, because its awesome and i know its been in more movies than those listed.